The Vegan Eggz Cookbook is a culinary guide to creating a wide variety of plant-based egg alternatives which closely approximate the aesthetic qualities of real cooked eggs and egg-based foods. Vegan Eggz Essentials is my first product sold under The Gentle Chef label. It is used in many, but not all, of the recipes in this cookbook to create remarkably realistic simulations of cooked eggs (agar powder is still the ingredient of choice for preparing cold-served eggz). My new recipes using Vegan Eggz Essentials are the result of my quest to create home-prepared egg alternatives that have the appearance, flavor and texture of real eggs but which can also be cooked like real eggs. The exciting thing about these alternatives is that they are easily prepared using soymilk or almond milk and can be customized for different culinary purposes. Vegan Eggz Essentials is not an egg replacer or complete mix like other commercial egg replacer products on the market. It consists of 2 special ingredients portioned and sealed in their own individual pouches and sold in one convenient package. When mixed with soymilk or almond milk, these special ingredients work synergistically to set the eggz mixtures when cooked. This is quite different from egg alternatives prepared with agar, as agar mixtures require chilling in order to set and cannot be served hot. The ingredients in Vegan Eggz Essentials are 100% plant-based, soy-free, egg-free, dairy-free, nut-free and gluten-free and contain no nutritional value of their own other than dietary fiber. However, since the eggz mixtures are prepared with either soymilk or almond milk as a base, if you have a soy allergy you will need to use almond milk as a base, and vice versa. Each package of Vegan Eggz Essentials (130 grams) can be used to prepare 20 one-cup portions of scrambled eggz mixture (enough for approximately 40 indivdual servings of cooked scrambled eggz); or 10 quiches or frittatas; or 100 eggz whites; or 320 firm-set eggz yolx. Tofu-based egg alternatives are also included in the cookbook for variety. In some cases tofu is required for functionality of the recipes. The tofu-based options do not require Vegan Eggz Essentials. Vegan Eggz Essentials is solely distributed by Modernist Pantry LLC. Click here to order. 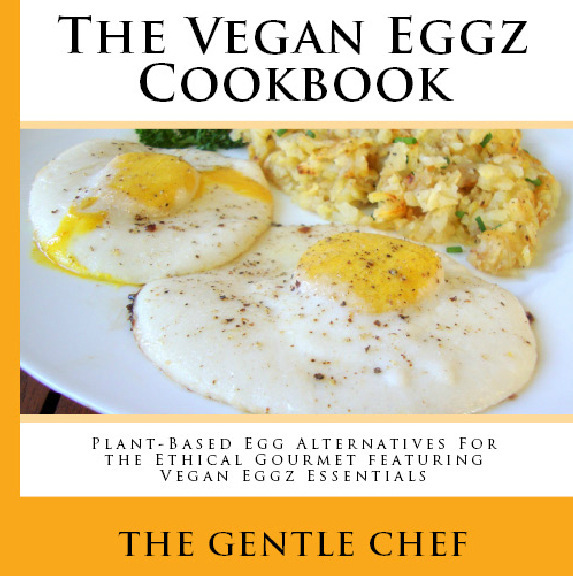 The Vegan Eggz Cookbook is available in digital format as a PDF file (it can be purchased by clicking the “Add to Cart” button at the bottom of the page). The cookbook is beautifully illustrated with large, full color photos and contains active menu links for easily navigating the recipes on your computer or mobile device. Please be aware that the most of the recipes in the cookbook require Vegan Eggz Essentials and other special ingredients. Please review these special ingredients before purchasing the cookbook by clicking here. The file is intended solely for your personal home use, so in accordance with copyright laws, I ask that you do not distribute the file. If you wish to share with friends, please repurchase the file. All sales are final – no refunds please. It is recommended that the file be backed up on your computer; files lost due to personal computer issues or error will not be replaced free of charge.